I am really a big fan of ReSharper! With Visual Studio 2010 I had to upgrade to version 5.0, which is currently in beta. Havenâ€™t played with all the new features but this will come. Iâ€™m sure. Anyway.. I was looking at some new functionalities Visual Studio 2010 had to offer. Wanted to try out the new native Generate code based on usage. The problem however, well problem, is that ReSharper already had this functionality before. So if I try to call a method which is not defined in my class, ReSharper will immediately ask if it needs to create that method for me. But I wanted to see Visual Studio 2010 doing that. So I had to find a way to stop ReSharper from helping me out. Didnâ€™t want to uninstall so I had a look in ReSharper and Visual Studioâ€™s settings. Then I noticed that it can be done very easily from the Visual Studio Options window (Tools â€“ Options â€¦). Look for the ReSharper node. 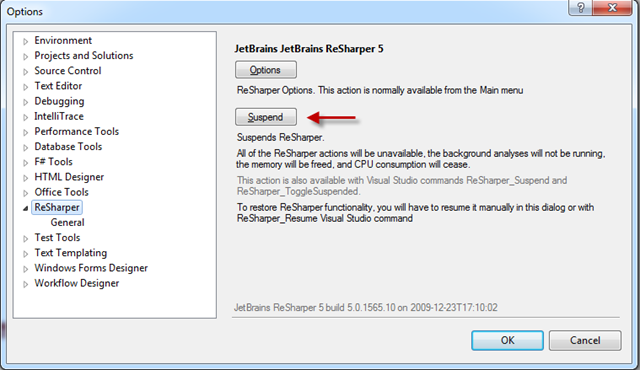 As you can see, there is a button to suspend ReSharper. 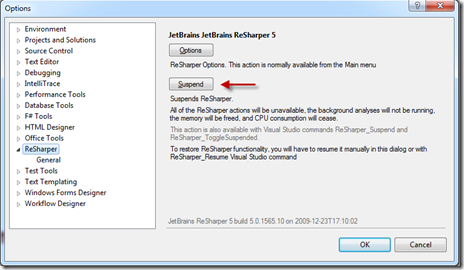 This click will temporarily remove all ReSharperâ€™s power. Afterwards you can of course enable it again without a problem.